I’ve always liked a challenge, so it’ll be no surprise to many of you that when the opportunity presented itself in May this year to have a go at crochet, I got stuck in! Like with many things, though, I needed to adapt the process so I could do it more easily, because I just don’t have the dexterity they had when they created crochet. Before I go into that, though, what is crochet? That’s the question I asked…after I said I wanted to give it a go. Say I’ll do it, figure out how to later – that’s how I live. 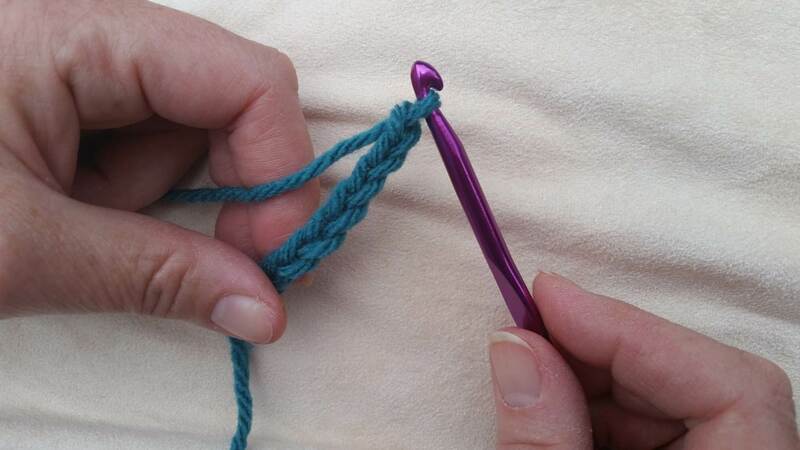 Anyway, as I was saying, crochet is a handicraft using a single hook and some yarn. You can crochet a wide range of items, from blankets to soft toys to clothing and much more. The possibilities seem endless! 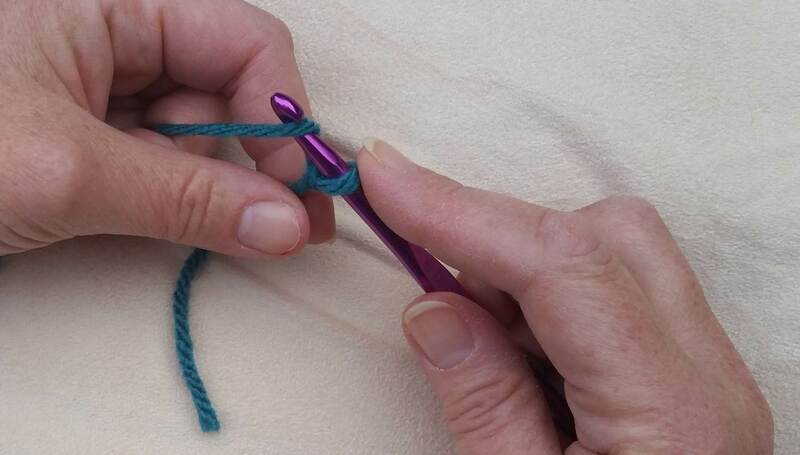 Normally you hold the hook in your dominant hand and handle the yarn in your other hand. 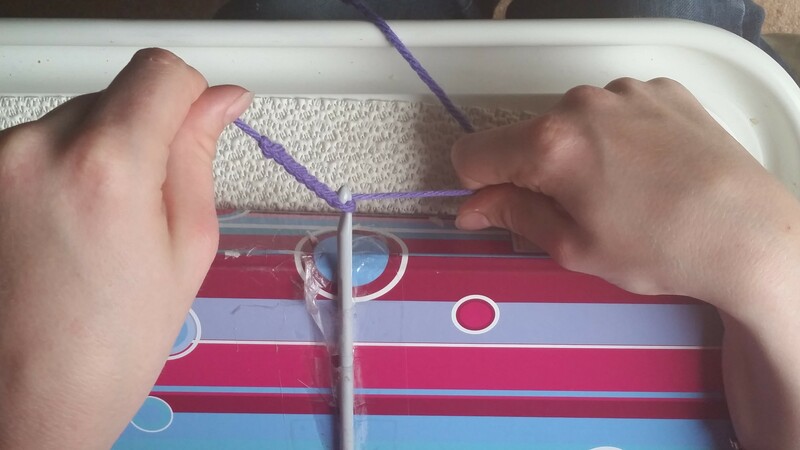 Stitches are created by wrapping the yarn around the hook so it can then be pulled through the loop(s) already on the hook. The hook needs to be twisted during this process. 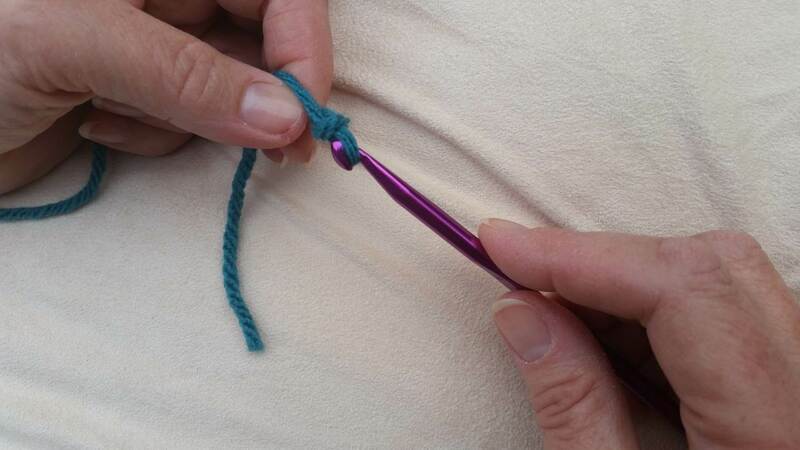 The first time I picked up a crochet hook I found that I couldn’t hold or twist it very easily because I lack fine motor skills. 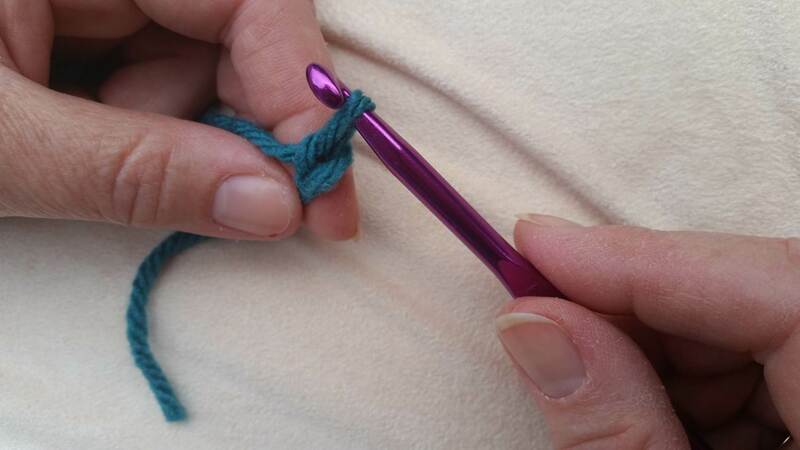 The long, thin shape of the hook makes it awkward for me to hold, so to compensate for this I had to grip it very tightly, which caused a lot of tension in my hand and it became painful very quickly. Such minor obstacles didn’t deter me, though. 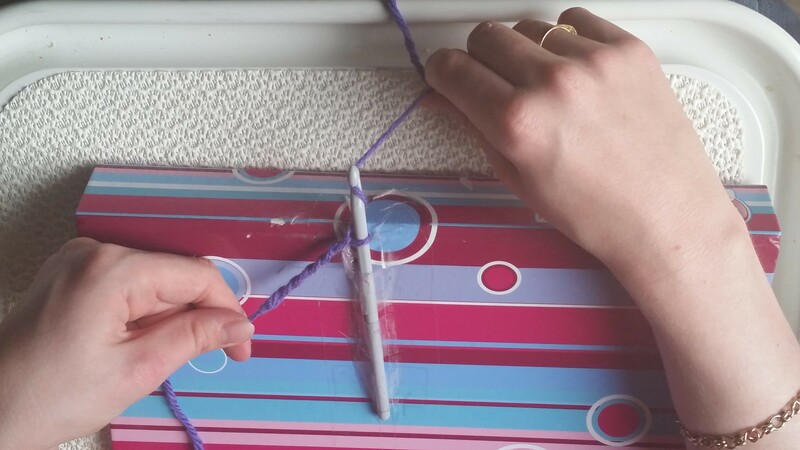 I realised I needed to find a way to keep the hook still, and angled up and away from me, so I could just handle the yarn. The idea then dawned on me to stick it onto an A4 file, which I could have in front of me with the spine facing away to give me the angle I needed. I suspected I’d be pulling on the yarn a fair bit so quite a lot of cellotape was needed to make sure the hook stayed in one place! The folder also needed to be kept still, so I tried sticking it to the table but found this too high for comfort. Sitting on the sofa with the folder on a non-slip lap tray was much more comfortable. Now all I had to do was work the yarn around the hook, by wrapping it round with one hand and moving what I’d already crocheted over the end of the hook with my other hand. I was right about the amount of cellotape needed – I pull on both the yarn and the item-in-the-making fairly hard so I can achieve what I need to (so much so it needed to be re-stuck three months after I started in May, and really needs doing again now…). Now, this blog wouldn’t be complete without telling you what I’m making! I’ve started with a relatively simple (but definitely not small) project, a granny square blanket. 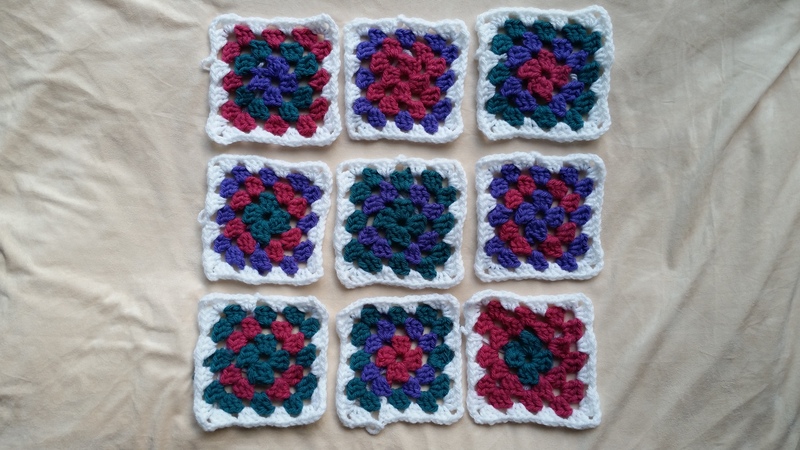 Simple because you make lots of small squares over and over again that you then join together to make your blanket. I learnt the way anyone learns to do anything these days, on YouTube! I used a fantastic tutorial created by blogger and crochet YouTuber Bella Coco, which you can find here. She’s done lots of tutorials so if you already crochet and want some fresh ideas check out her channel! There are FAR too many possible combinations for me to stick to just a few, especially as this is a ‘trial’ blanket that I can have a bit of fun with, so I’ve decided to do as many combinations as take my fancy before putting them all together at the end! I’ve been reeeaaaally tempted to start joining them, but I’m trying to be patient so that I can move them around when I’ve done them all and get the colour balance right. I will eventually have a blanket for my sofa, but perhaps not by this winter, especially as I’m working on a cross stitch project at the same time! What I love about crochet is being able to create something from scratch and know that it is ALL through my effort, down to the colours and the way they’re put together, so I love seeing my squares grow and multiply! I also enjoy it as something completely different to the cross stitch I’m doing, where I’m following a pattern and all the colours are there for me.